As a beginner, when you step onto the dance floor it can be pretty daunting. All the more experienced dancers flowing around, not sure how and when to join the flow, worried you might forget your routine – WOW! I thought this was supposed to be fun! Here are some tips to hopefully smooth your way onto the dance floor. Whatever the shape of the dance floor, imagine it as a rectangle. For the beginner the direction you dance ballroom is anti-clockwise – think of it as the “lead” dancing to their left and the “follower” to their right. Progress around the dance floor following the outside – this is known as the “line of dance”. Even if the more experienced dancers cross the middle of the floor, avoid this at all costs – collisions can occur. In your early learning to ballroom dance you will have encountered the concept of Zig Zagging around the dance floor. Most beginners, when joining a dance floor will invariably go to the part of the floor which is similar to where they learnt their steps – it gives certainty. 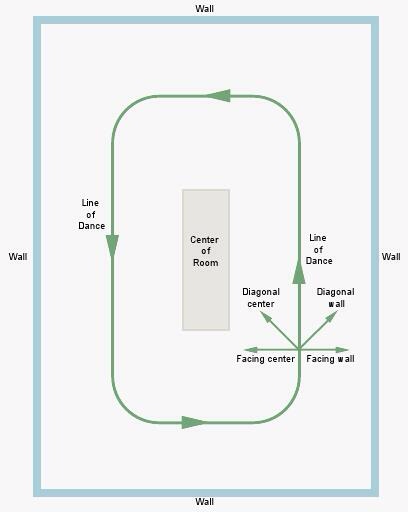 In ballroom join the floor with the lead facing diagonal to wall (see Dance Floor diagram). · When moving from one line of dance to another (using basic steps) come down the zag and turn to the new line of dance going up the Zig.